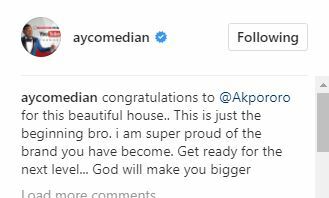 Ace Nigerian comedian Ayo Makun has congratulated comedian, Akpororo on the completion of his new mansion.. Except the Lord builds a house. The labourer Labours in vain. Father thank you for this one. I dedicate this to my wife and daughter.